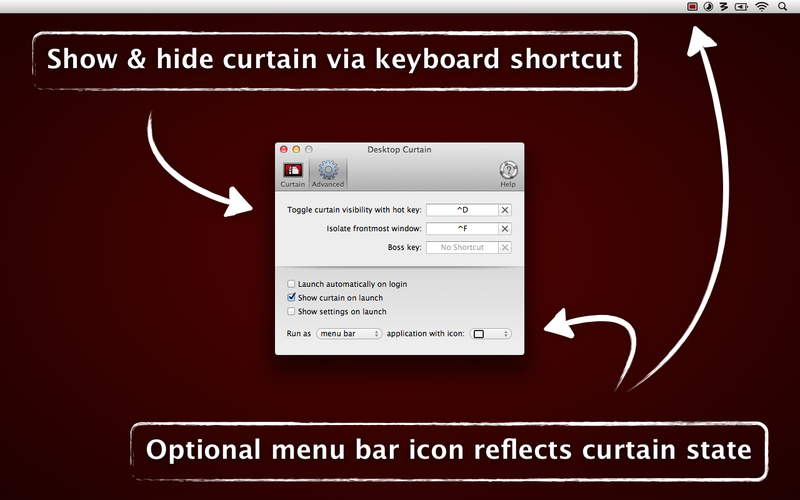 Desktop Curtain 3.0.9 requires macOS 10.8 or later. Visit the museum if you are running an older version of OS X. Desktop Curtain is presently available in English only. 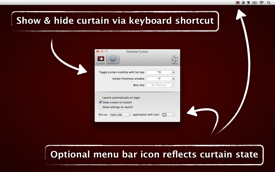 Desktop Curtain has an unlimited free usage mode. When used in free mode, you won't get image history, window or application isolation options, hot key control, the ability to run as a menu bar app, and other features. Desktop Curtain includes a 60-day money-back guarantee for those who buy directly from us. (We have no way to process returns for Mac App Store purchasers.) If you're not satisfied with your purchase, simply email us for a refund. Behind the icons on your desktop, so it acts like a desktop image. On top of your desktop icons, instantly hiding the clutter. Behind the frontmost application, hiding everything but that application. On demand, behind the frontmost window to focus your attention on just that window. In addition to its built-in curtain, Desktop Curtain can use any picture file, the current OS X desktop picture, or a solid color as its curtain; the choice is yours. You can easily change the color of the stylized curtain, or of any image with translucency. 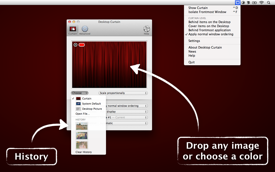 Desktop Curtain also keeps track of your last 10 used images, making it simple to choose from recently-used images. Desktop Curtain's settings give you full control over when and where you'll see its curtain (or image). On multi-monitor Macs, choose between the display with the menu bar or all connected displays. If you use Desktops (Spaces), choose whether Desktop Curtain shows on all Desktops, or just the current one. Optionally hide Desktop Curtain when entering Mission Control (Exposé). You also control the appearance of any images you use as curtains: their axes can be scaled proportionally or independently, or they can be centered or tiled. Desktop Curtain can be run in any of three modes (standard application, menu bar icon, or completely invisible), and offers fast access to its key features via a contextual menu on the curtain itself, via Dock pop-up menus, or via its menu bar icon's menus. You can define global hot keys to toggle the curtain's visibility or to isolate the frontmost window, and setting Desktop Curtain launch at login (with its curtain optionally hidden) is as simple as checking a box. There's even an optional 'boss mode' hot key that will cover everything, including the Dock and Command-Tab switcher.